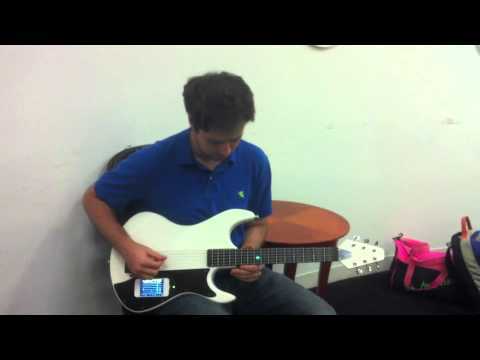 In a nutshell, the gTar is a $450 guitar with an iPhone for a brain. We reported earlier this week on how it has raised lots of money. Many early supporters agree that this thing looks awesome, and it’s not even the first instance of a learning guitar, or even one that runs on MIDI for that matter. But it’s the first we’ve seen that puts it all together the right way, with the right look, and the right brain: a smartphone app on an iPhone. Idan Beck, Incident founder and CEO, visited a recreation room in New York City with his girlfriend and his director of marketing Josh Stansfield to tell us about gTar; show us how it works; and of course let us play with it (pics or it didn’t happen — see below). During the course of all this, I found 10 reasons gTar deserves the money and attention being showered on it. Beck grew up in Silicon Valley with old-school technologists for parents (more on them below). A longtime guitarist, he was producing electro-house music in college when he bought a thing to convert guitar to a MIDI signal, so you could use a guitar to control other sounds on a computer or sample bank. During this early period, Beck worked on the concept that would eventually become gTar part-time. His day job was at Microsoft, as an intern for under a year, then as a software development engineer. Then he came across the monome when it was first released, which would have been in April, 2006 (my blurb). He figured he had something worth pursuing. He quit Microsoft. Three years later, he and his small team launched a Kickstarter campaign to raise money to hone the final design. By then, the product was past the prototype phase and nearly into production. The crowd went wild. This was a major Kickstarter success story earlier this week, as word spread through the company’s involvement in the TechCrunch Disrupt NY conference, more and more people pledged to fund the project. The first donation happened on Monday, May 21. reached$153K by Tuesday. $206K when we met on Thursday. $224K on Friday. $238K on Saturday, with 624 backers. It’s no simple matter to convert something as analog as a guitar into MIDI information, the way gTar does, and people have been trying to get it right for years. His solution involves conductive frets, for starters. It mashes that information against analysis of the vibrations of each string, each sampled individually a higher resolution than a CD. The proof is in the pudding. The pudding tasted good. Granted, I only spent a few minutes with the gTar, but I bought the concept. Part of the reason this works is the low latency, or the time elapsed between strumming the strings and hearing the sound come out of the iPhone’s speaker, either in a guitar tone, a piano sound, or anything else. The unit I played came from Incident’s factory in China, so it’s “real.” Units will also feature a regular 1/4-inch output for connecting to amplifiers and recording equipment. Here I am picking my way through the Beatles’ “Blackbird” with gTar. Granted, many musicians are suspicious of something like this — in part because so many guitar-to-MIDI boxes are subpar, in part because others have tried to do something similar, and in part because dammit if they learned the hard way, so should everyone else. I’ve played it, and I think it could really teach you guitar. No, it won’t put guitar teachers out of business. - - – – – 7. Even Music Teachers Would Use It. We’ve seen plenty of products and apps promise to replace music teachers, and sometimes we even think it’s possible. But now that we’ve seen this fully-integrated combination of high-quality hardware, solid engineering and design, and a smartphone app, we’re convinced that it could make sense for guitar teachers to buy some of these units and rent them out to students as learning tools. He said he’s in talks with Little Kids Rock about putting the gTar in classrooms across the country. The gTar guitar outputs CoreMIDI at a low latency — we’d explain how, but this article is already too long as it is. But what that means is that it can output those MIDI signals to any object that understands it, including an iPhone or a computer. It also supports USB MIDI on its own, so you can plug it straight into a computer to trigger sounds and record information that way. In other words, this isn’t just for noobs learning in their bedroom — it also has a place on stage. Beck also demonstrated apps that let you play the guitar and add effects, using the iPhone’s touch screen somewhat like a Kaoss pad. Nice. The part of the guitar that holds the iPhone can be popped out and replaced with another fitting for another phone — by the user. This means that when the next iPhone comes out, you’d be able to get the new fitting so it will work with the gTar. It already works with Android via CoreMIDI and a USB output that can connect to supported Android phones. Incident is working on getting Android working with a native app, and the same gTar I played today could potentially fit an Android model with a new fitting. Like all man-made objects (except the titanium spork) gTar could always improve. The next step, according to Beck, will be to add a pick that will integrate with the fretboard and bridge sensors for even more control, allowing advanced playing styles that wouldn’t even work with a regular guitar, and more precise detection of notes. Incident’s Kickstarter campaign ends in 30 days, around the end of June. Incident wants to ship gTar by August or September to people who contributed to the Kickstarter, after which it will be available to everyone else for $450. iPhone is that type of phone which support various applications that people need. The main advantages of iPhone are user friendly and better applications. Thanks for sharing a valuable information about features of iPhone.